With decades of experience in the energy industry, TAB helps you save money, increase operational efficiency and reduce risk with proven strategies and solutions for managing records and information. Keep production flowing by providing secure, instant access to land records. Stay profitable and competitive by lowering your storage costs for inactive records. Save space and improve worker efficiency by digitizing land records and other paper-based information. Ensure business continuity and information security during large corporate deals. Improve efficiency by bringing land records and other paper documents online. Meet regulatory requirements throughout the records lifecycle. 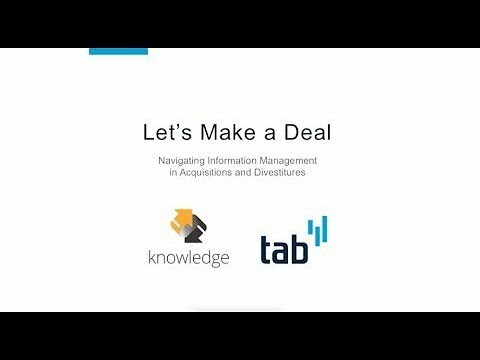 Watch our panel of experts share their insights about how to achieve success and get involved early in the deal process.